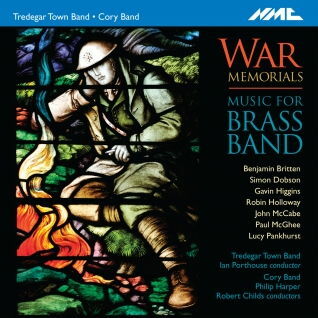 The leading brass band magazine Brass Band World has given this year's Brass Band CD of the Year Award to NMC's ground-breaking compilation entitled War Memorials. Masterminded by Paul Hindmarsh, the CD contains, apart from McCabe's The Maunsell Forts - Nocturne for Brass Band, a number of other very interesting works, by Benjamin Britten, Robin Holloway, Lucy Pankhurst, Simon Dobson, Gavin Higgins and Paul McGhee.
' The highlight of the winning disc was the inclusion of John McCabe's gloweringly dark, yet masterful The Maunsell Forts, licensed from a live BBC Radio 3 broadcast given by Cory [Brass Band] under its former Musical Director, Robert Childs', says the citation. The rest of the CD was specially recorded by the Tredegar Town Band, under its Musical Director, Ian Porthouse.